April 2009 - Page 2 of 2 - Pebbles, Inc.
Our design team has just allowed me to show you only a sneak peak of our Lil’ Buddy Collection that is set to arrive in May 2009. If I told you how cute it was, I believe you would be jumping for joy and doing cartwheels! 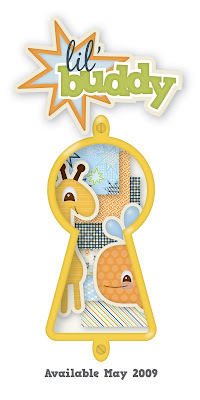 This collection includes 6 double sided printed papers and 3 stickers that are designed for Baby & Toddler Boy. These designs are sure to grow with your child… I’m talkin’ cool boy designs! For everyone that leaves us a comment on our blog and places this design and link to their blog or facebook to help us spread the news, please know it is much appreciated and you can be one of the 6 winners to receive a complete set of our Lil’ Buddy Collection the moment it arrives! Larry is making room for our new Metallic Chalk Sets that are arriving at our warehouse today! Yippee! These chalks have a different consistency then our powdered chalks. They are slightly goopy, have brilliant metallic colors and are real fun AND are addicting to play with! They work fantastic with our new Pebbles stencils. 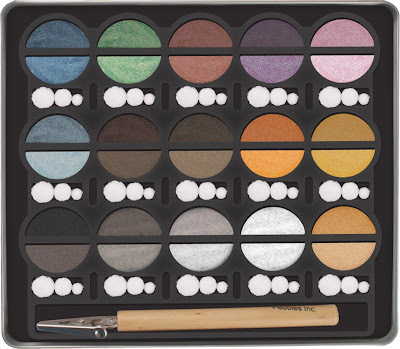 We will draw six lucky winners to receive New Metallic Chalk Sets. Everyone that leaves a comment on our blog during April, will be entered to win.